As my friend and fellow area film critic George Thomas pointed out to me, the premise of Pixar’s INSIDE OUT bears more than a passing similarity to that of a Fox TV show from the early nineties that I had forgotten about, “Herman’s Head”. In both, the set-up is that inside the mind of the main character live various anthropomorphic representations of certain character traits. Of course, it’s not the basic idea of a given story that matters so much as what is done with it, and true to form the folks at Pixar manage to whip up a clever and entertaining story that, even if it were inspired by the long cancelled TV show, puts a unique and entertaining spin on the idea. 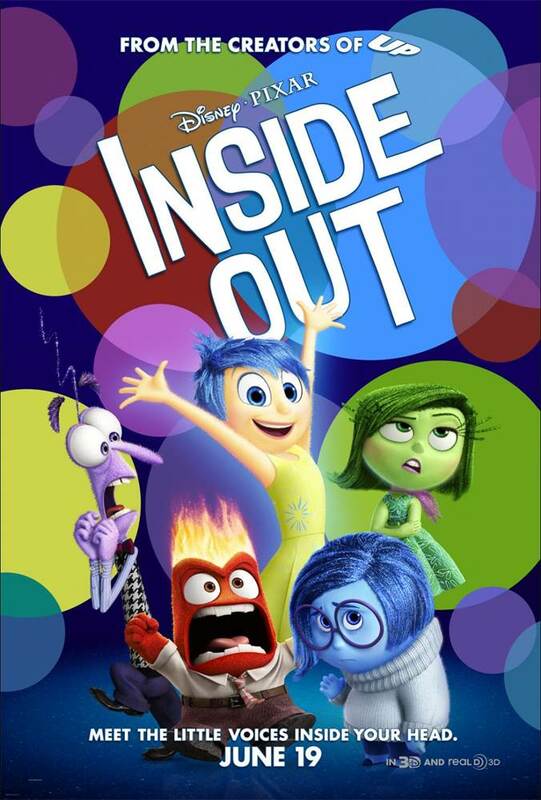 In INSIDE OUT, rather than the head of a thirty-something office worker we find ourselves in the mind of Rile (Kaitlyn Dias), an eleven year old girl whose happy life has recently been upended by a move from Minneapolis to San Francisco. Up until this time, Joy (Amy Poehler) has been head honcho of Riley’s head, with Anger (Lewis Black), Fear (Bill Hader), and Disgust (Mindy Kaling) taking over when needed. Sadness (Phyllis Smith) is up there in mission control as well, but none of the other emotions is quite sure what her purpose is, and they do their best to keep her from taking an active role most of the time. Through a series of circumstances, Joy and Sadness wind up getting sucked out of their comfy control room, taking with them a handful of important “core” memories that need to be returned for Riley to function properly. But getting back is no easy task, requiring a trek through various “islands” of Riley’s personality, among them Family, Friendship, Hockey, and Goofball. Along the way, they find aid from Riley’s childhood imaginary friend Bing Bong (Richard Kind), who has been living in her subconscious. Meanwhile Riley’s personal life continues to be difficult, and with Joy not there to run the show, Anger, Fear, and Disgust have a difficult time coping. Overwhelmed by the situation, they come to the conclusion that the only way to make Riley happy again is for her to run away and go back to Minnesota. Directed by Pete Docter (UP, MONSTERS, INC.), the film does a good job mixing humor and pathos while providing a kid-friendly model of consciousness, to boot. In particular it does a good job of showing why sadness is important and not necessarily all bad. The voice cast are well chosen, led by Poehler doing a toned down version of the type-A control freak persona she played on ‘Parks and Recreation’ for seven seasons. Black is also perfectly cast as the embodiment of anger, as anyone familiar with his comedy stylings would imagine. Like Docter's UP, INSIDE OUT seems geared towards a slightly older audience than the average Pixar film, but that didn't stop my 4 year old son from enjoying it thanks largely to the rich and colorful character and world designs. Unfortunately, and perhaps somewhat surprisingly given a film so overtly about emotions, it never quite makes the kind of emotional connection that UP did. But if INSIDE OUT falls a bit short of Pixar's “A” game, it’s at least a welcome improvement over the uninspired sequels like CARS 2 and MONSTERS UNIVERSITY the company has focused on in recent years. 3 out of 4 stars. OMFG Your friend is right! INSIDE OUT is Herman's Head! And Soylent Green is people! To tell the truth, after THE BRAVE Pixar movies held so little interest for me that I rather stopped thinking much about them, my only excuse for not figuring this out myself. Does your friend also know how I can find a decent job around this region?